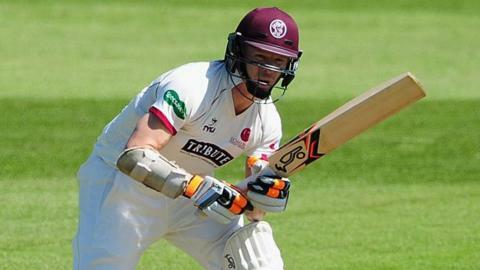 Somerset skipper Chris Rogers marked his return to Lord's to meet his old county Middlesex with a century before a premature end to the day's play. After the early loss of Marcus Trescothick, one of two victims for Toby Roland Jones, Rogers put on 85 for the second wicket with Tom Abell (41). He then shared a unbroken third-wicket stand of 125 with James Hildreth. When play was finally called off at 18:00 BST, Rogers was on 104, with Hildreth on 60, in a total of 219-2. Nine of the former Australia Test opener's 74 first-class centuries have now come at Lord's. That is a total exceeded only by the 13 he has run up at the WACA in Perth, where he spent 10 seasons playing for Western Australia.